Baptisms are celebrated once per month in English (Sundays at 1 p.m.) and Spanish (Saturdays at 1 p.m.) All baptisms should be scheduled at least six weeks in advance. Baptisms during a Sunday Mass, or at a time outside the monthly schedule, must receive permission from the pastor. 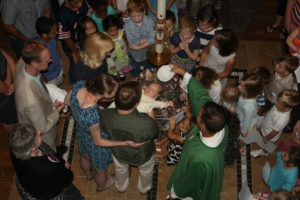 Download a Baptism Application and return it to the rectory office by email or drop off in the parish office. Please note: You must be an active parishioner for at least three months before a baptism can be scheduled at St. John Berchmans. Additional Baptism guidelines can be found on the back of the application form. At least one parent is required to attend a Baptism Preparation class prior to the baptism of their child. Godparents are not required to attend, but they are welcome. Download the current schedule for both classes and baptisms. Please call the parish office at 773-486-4300 with questions or to schedule a baptism. It is important to understand the importance of the sacrament of baptism. Before baptizing their children, parents attend a baptism preparation session that reviews the symbols and overall ritual of this most holy sacrament. Sessions take place on the first or second Tuesday of every month from 7:00-8:30 p.m. Consider becoming a baptism preparation class facilitator! It is a great, minimal-commitment way to get involved.